Twenty-four hours prior to hopping into a plane for a fifteen-hour journey, I had no idea I would eventually be making it to Chennai. My Nigerian passport seems to be the gift that keeps on giving where it has to do with being a document that, rather than aid mobility, actively facilities its restrictions. I was informed by the Indian embassy that holders of a Nigerian passport will have to wait six to eight weeks for their visas to be ready. What for! Many applicants of other nationalities are simply applying and printing out their visas online almost as fast as they are in and out a self-service photo booth. “Nigeria did not colonise India!”, I would find myself muttering time and time again. Anyway, all of that was eventually bypassed thanks to the relentless push by the organisers of the Chennai Photo Biennale by whose invitation I would be partaking in “Light Writing”, the International Conference on Photography. Chennai is in South India – if I am to be precise, I would say Southeast India – with its edges fading into the Bay of Bengal. Stepping out of the airport, the jolt of hot but also humid air was all too familiar given the similarities with Lagos, itself a coastal city. I would later learn that Chennai boasts of the longest beach in India. And as anyone with an inkling of colonial patterns would by now have guessed, it is also the location of a colonial fortress, Fort St. George. But what might not be readily known is that this fortress is the very first British fortress founded in India in 1644. The city then was known as Madras (many people I met still refer to the city by this name). It’s been said, although arguably so, that Chennai as a city evolved around the Fort. The language mostly spoken in Chennai is first Tamil, then English. Tamil belongs to the distinct Dravidian language group which equally includes Telugu, Kannada and Malayalam. These other languages are predominately spoken in the three other States that make up South India. Tamil, as I have come to understand it, is not just a language, it is to also an identity. If you speak Tamil, you are from Chennai, if you don’t, you are this other Indian. Yet, this other Indian could be a Hindu, Muslim, or Christain for which lingual identity is downplayed. Add to all this race: the standard of beauty and wealth follows the gradation of skin colour – dark to fair – often mitigated by such euphemism as “wheatish tone” for those not considered outrightly fair but beautiful and well to do. Finally, there is the caste system. All of this makes Chennai, and India as a whole, a playground for perhaps the most complex identity politics I have ever come across. Here, it is not as simple as Black and White. This brings me headlong to the Chennai Photo Biennale. I must begin by saying that from the onset, one gets the feeling that the Artistic Director Pushpamela N – an artist in her own right – has a good grasp of the intricacies, not just of Chennai, but of India’s identity politics. It is crucial to note that this year’s event is the 2nd edition of the first photography biennale in India. Thus, a foundation is being laid. And much like the approach taken by the founder and organisers of the Addis Foto Fest, but something that the Lagos Photo Festival woefully failed to envision, this Biennale is very much rooted in, or should I say, preoccupied with reaching first and foremost the people of Chennai and India. It is not a project that sets its gaze offshore in a bid to find credibility and validation outside the realities of its locality. It is looking to do things the other way round; recognising sooner rather than later that the sustainability of any progressive art or intellectual event depends very much on carrying the people and the community along as it grows. The content of the Biennale, as well as the exhibiting artists, is quite India-centric so much that it is highly probable to think of the Biennale as too nationalistic. However, should one ever get to the point of transcending that peripheral reading, what becomes evident is the impulse to encourage conversations around and within the complex sociopolitical realities of India and, to some extent, the neighbouring countries and regions. If this is not putting the right foot forward – for a budding Biennale in a country such as India – then I do not know what is. Also, many of Indian artists exhibited offer a more fluid, nonlinear way of thinking about the dichotomy between the national and the international, with them living, working or moving between India and elsewhere in no pegged-down order. I heard Pushpamela, at some point, say that the aim was to curate an event that the people will enjoy rather than have them feel it was heavily ladened with issue-based works. The last time a heard the expression “to enjoy the works” was in relation to the 10th Berlin Biennale; ever since it has retained a somewhat dubious connotation for me. Thus, while I cannot vouch for the success of Pushpamela’s intention, what I do know is that it did not blunt the sharp edges of the Biennale with regards to its ability to address or bring into dialogue hard and complex realities of India. I think of the collaborative work by Sheba Chhachhi and Sonia Jabbar, When the Gun is Raised the Dialogue Stops, displayed at the Senate House – one of the spaces repurposed for the Biennale. This installation, which looks into the Kashmir conflict sustained by territorial tussles between mainly India and Pakistan, employs texts and photographs as central components. One unit of the installation features a text and photograph mounted separately on two rectangular metal plates that form an angle with each other as if to suggest an open book. 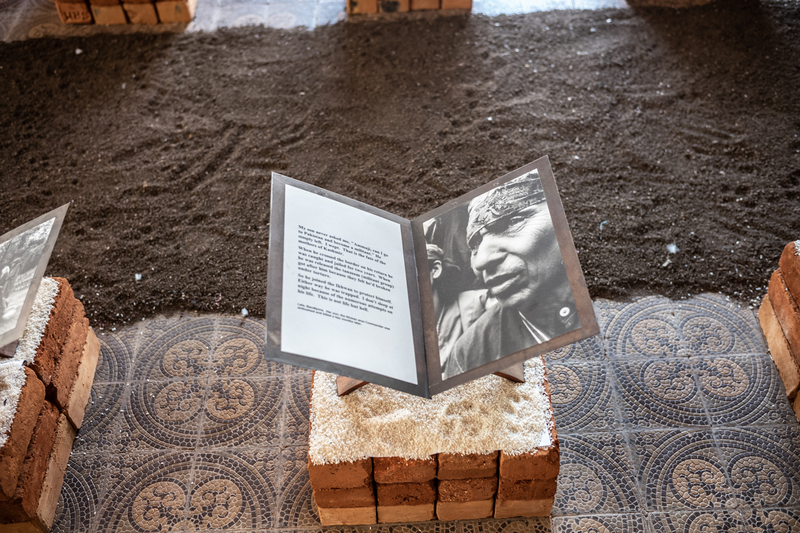 The “book” of text and image is in turn placed on bricks upon which is a layer of rice grains. The text–image relationship is complimentary; one serving as a caption for the other. The installation, according to the artists “invites the viewer to enter the private spaces of war, to hear voices normally drowned out by the clamour of contesting stereotypes —the voice of ordinary women of Kashmir”. The piece is compelling and accessible for its ability to communicate intimate knowledge. We hear the voices of the women, we feel and allow ourselves imagine the numbness that comes from perpetual subjection to suffering, of being torn apart by political and religious ideologies that have very little or no place in the simplicity of life. We hear them in our heads and in our hearts. At the government college of Fine Art, another key exhibition space, we are presented with an array of photographic oeuvres. Positioned to instantly engage the audience and stretching all the way across the middle of the partitioned space, is the human-scale photographic prints of Vijay Jodah from the body of work “The First Witness”. This work tackles in a frontal manner the agrarian crisis of India which, since 1995, “have claimed over 300,000 lives by way of farmer suicides”. They are portraits of widows holding photographs of their deceased spouse. The caption of each image brings home the jarring reality: these farmers, upon realising they cannot pay back the debts they owed, took their own lives – leaving behind the families for which they toiled. The scale of the prints are striking, and deliberately so, to “subvert visual culture in India where such large hoardings are a monopoly of the famous and the powerful”. As if to mirror this focus on the less powerful of the society, the installation to the left of Jodah’s works is of photographic works and texts from the People’s Archive Project of India. A project which, in many ways, have succeeded in documenting, articulating and giving agency to rural India in no small scale. Many of the photographs on display were made not by P. Sainath, the award-winning journalist (and a living legend, as I have come to learn) who founded and continues to run the platform, but by the women of the communities themselves who learnt to use the camera through training programs initiated by the project. Now, let me leapfrog to one body of work for which I am confident to evoke the word “beauty”. Kowshik Vasudevan’s Fragments is a series of square-format colour photographs framed in white wood. 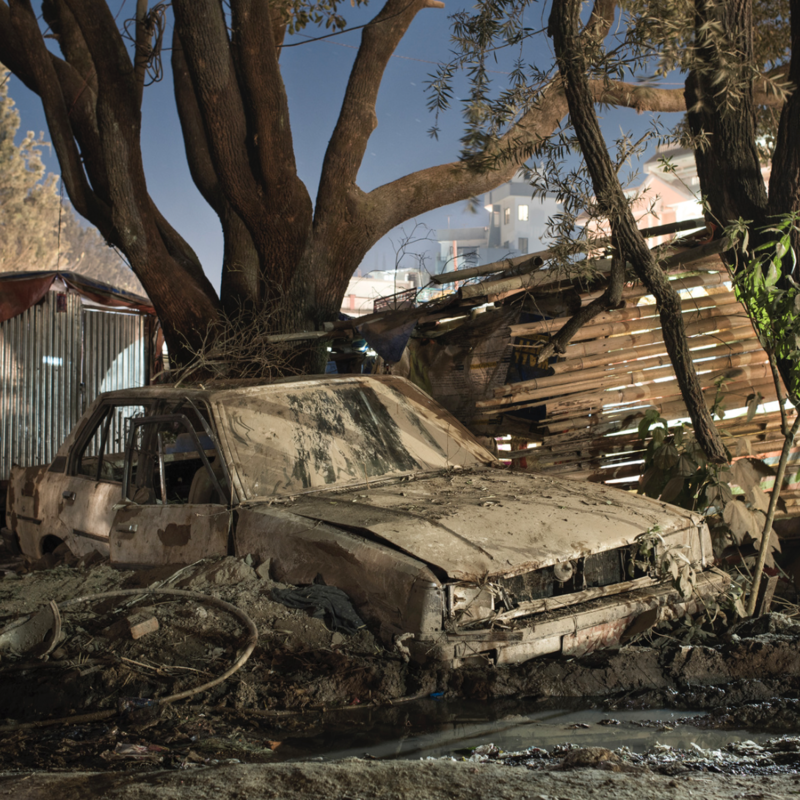 They are photographs of dilapidated vehicles abandoned to rot on streets and roadsides. Vasudevan is a freelance photographer based in Chennai. I don’t know what significance this holds in relation to the sensitivity of gaze he brings to his subject matter. He is careful to account for minute details, both of light and of objects. By that, there is an interplay of life and afterlife at the crevices of fragmented shadows cast by decomposing objects. He employs the compositional quality of contrast in such a graceful way that nothing feels contrived. His photographs exude the kind of beauty that says: beyond all the ugliness, the dejection, the decadence lies nature’s innate character of condoning; always leaving room, however perceptual, for the impossible. A kind of beauty that hints, despite gloomy exteriors, of something deep down yet unburiable: a spark of life’s generosity. I have touched on some works, not to place them on a pedestal or accord them an exclusive place amongst the many compelling works featured in the Biennale; spread out across 15 locations within the city. It suffices, then, to say that the Chennai Photo Biennale excelled in offering multifarious perspectives grounded in issues, themes, and conversations relevant to the people of India, and perhaps even beyond. But what it does even better is how much it made photography tangible, and relevant beyond the esoteric confines of art discourses without disavowing its place or already garnered merits in the intellectual space. Beyond art, it delved into the question of photography’s place in “meaning-making through the visual”. In times when photography is more about what meets the eye than what new horizons are revealed, it is more important to hold the medium to high standards; to question its limits, its assumptions. To employ it as a tool for proactive seeing. The title of the Biennale, Fauna of Mirrors, is apt. We know what mirrors do when they are placed in relation to each other, rhyzomically. Like echoes, they replicate perpetually the image of whatever is of them or in between them; going back and forth a given departure point in no given order. In the second part of this essay, I will do a more in-depth recount of my encounters in Chennai while focusing substantially on Light Writing, the conference component of the Biennale, my observations as one of the panelists.